April’s daughter is in kindergarten, but she felt it was important to start as she means to go on – as a show-stopping, jaw-dropping, awe-inspiring gosh-darned winner. A photo of April’s effort- which depicts her daughter Atlantis sporting actual Little Mermaid hair, inspired by the Disney film of the same – instantly went viral, snaffling more than 130 000 retweets and upwards of 700 000 likes. Her older daughter – named Ariel!!! – posted April’s handiwork to Twitter, so that everyone would know that peak Crazy Hair had indeed been achieved. Forever. 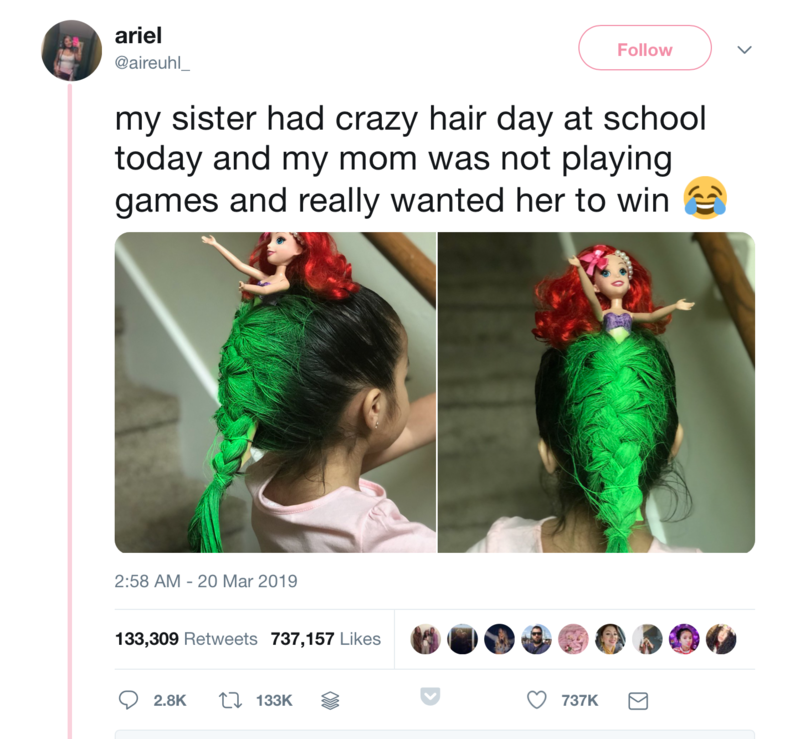 “My sister had crazy hair day at school today and my mom was not playing games and really wanted her to win,” Ariel wrote. “Sis came to slay,” one declared and she’s not wrong. “Being a huge mermaid lover this hits me right in the soul. She did an amazing job!” someone else posted and we feel just the same. “Why did y’all not call this The Little Merbraid?” another commented wondered and gosh she has a point.